So much yarn, so little time. : My sock is growing! The recommended yarn is tofutsies which is way out of my budget, so I asked Abakhan if they'd supply what I needed in return for a mention. 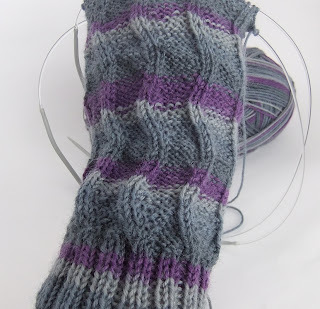 My challenge was accepted so I chose a self-striping purple and grey yarn, Aviemore along with two circular needles, a row counter and some stitch markers. The row counter was absolutely essential until I'd got accustomed to the pattern. I haven't used one for years, and was accustomed to keeping it at the end of my needle. This doesn't work out with circulars, so whilst knitting I just rested it on the pattern. I only needed stitch markers for the first couple of rounds, but they helped to get the pattern straight in my head. 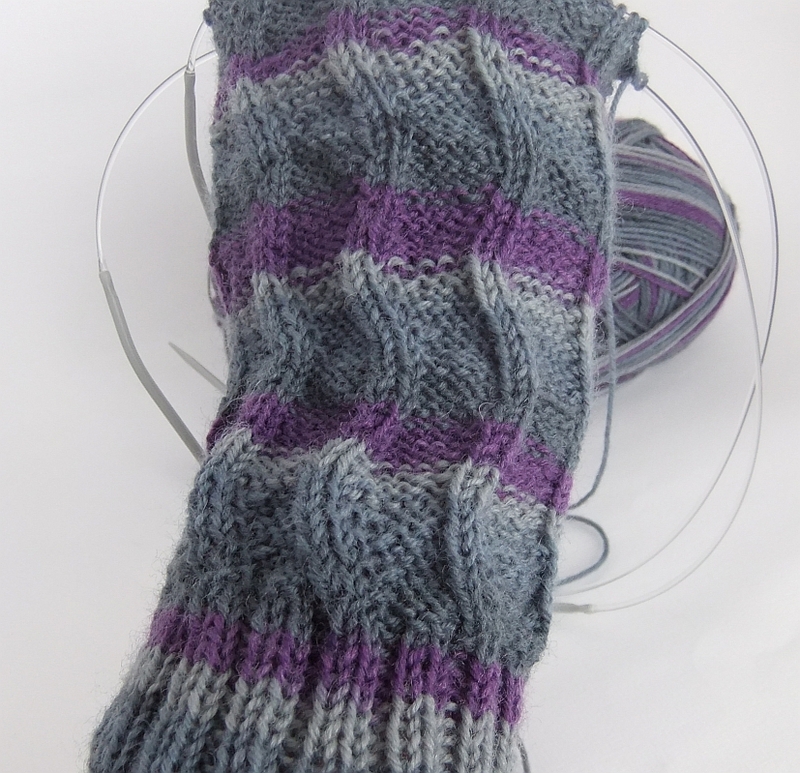 I'm pleased with how the sock is coming along, I think the self-stripe draws attention to the wavy pattern rather than detracts from it. I'm also pleased (so far!) 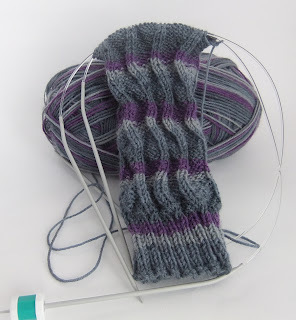 with working with two circular needles. I can't see any "ladders" as happens with DPNs sometimes. I usually avoid ladders by knitting an extra stitch or two at the end of each needle, but that tends to mean I forget where the true beginning of a row is - which would be a problem when I start the heel, my next task. Do you knit socks? I'd be interested to hear if you have tried the 2circ method, or indeed whatever works for you. It looks great. I have knitted a couple of one socks (never got round to finishing the other half of the pair)but I have never used circular needles to do it. I don't mind using DPNS but I am willing to give circular needles a go and I can see that they would be more useful when travelling.